Aimpoint Micro H-1 Red Dot Sight with 4 MOA dot and integrated standard mount is a lightweight sight that is perfect for extreme conditions. Built to offer the same battle-proven ruggedness as other Aimpoint products, the Micro H-1 performs reliably under extreme conditions while adding negligible weight to your weapon. The H-1 red dot sight is small enough to be used anywhere you could put iron sights. 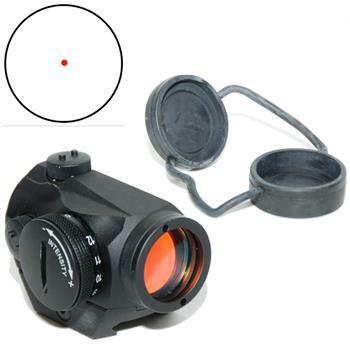 These sights can be used on any type of firearm or archery equipment. A lightweight rifle with an H-1 Micro mounted on it remains a lightweight rifle! A hunting revolver with an H-1 Micro installed remains as easy to carry as with iron sights and is much faster to aim. On a bow, the parallax free H-1 Micro eliminates the need for a peep, allowing you to shoot accurately in lower light. Lightweight - 84 g without mount and 105 g with mount. 4 MOA (minutes of angle). Precision adjustment for windage and elevation: top of protective caps fits into holes on adjustment screws - no other tool required. 12 settings for use in daylight and low light conditions. No laser emission that could be harmful to your eyes. Mechanical switch for speed and reliability.